The canvas locked me into a Lacanian gaze with a naked woman -- a rust-haired model named Kaitlin -- who the artist has portrayed in a way that highlights her sultry mood and unique beauty. Then again Kaitlin isn't entirely shown as unique: she likes some McDonald's fries now and then, so she can't be all that different from the rest of us can she? 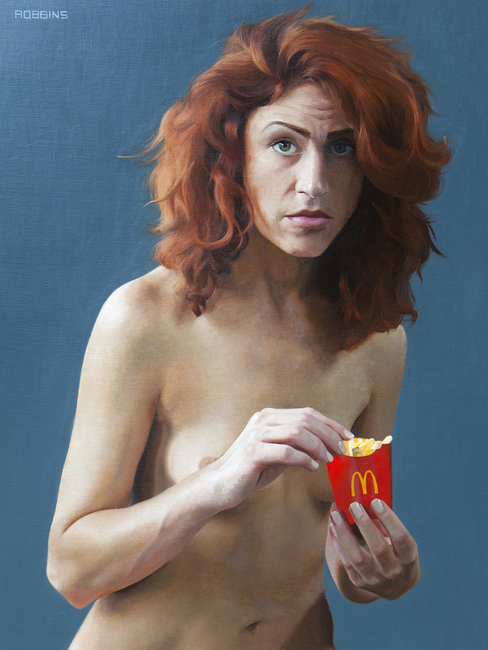 Veering back towards contemporaneity, Mrs. McDonald strikes me as a self-consciously powerful woman who makes her viewers complicit: she is keeping her fries to herself knowing that we are judging her for indulging in a guilty pleasure. "You have caught me," her raised eyebrow seems to say, "but you are just like me because you love them too, even though you know they are bad for you." Mrs. McDonald is an Eve for our contemporary situation, one in which we insist on our individuality and difference while both craving and fearing commonality. 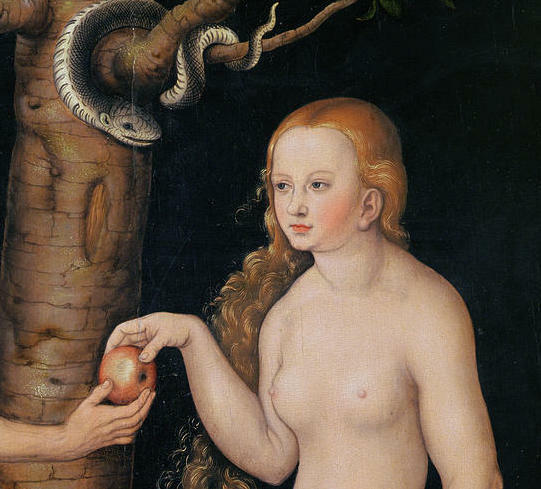 We know that we can't go back to the garden of innocence, but our shared cravings -- which corporations apparently understand better than any individual -- can at least remind us of the human urges that bind us across nations and faiths. A survey conducted by Sponsorship International discovered that far more of the people it surveyed worldwide could recognize that McDonald's golden arches (88 percent of respondents) than could recognize the Christian cross (54% of respondents). The word logo is derived from logos which originally meant "the word of God" and apparently the religion of capitalism -- a polytheistic faith with hundreds of prominent Gods/Corporations -- does a better job of knowing how to connect humanity than any faith or political party or leader. French fries are now the most popular vegetable in America, a favored food of Republicans and Democrats, gays and straights, Christians and Muslims: if they didn't make us fat we could think of them as a positive social force, right? Visual Artists have been split on how to adapt to modernity's embrace of efficiency at the expense of craft and variety. Marcel Duchamp celebrated factory-made (readymade) objects as "art" and Andy Warhol, an extreme pragmatist and canny social observer, adopted mass production and mass imagery as the keystones of his art. Beginning with the Arts and Crafts movement, other innumerable artists -- those who continued to assert their individuality and channel their ideas through their limbs -- have resisted McDonaldization while running the risk of being called conservative because their artistic habits are the same as those of Medieval monks not artist/CEOs who let other's multiply their products and ideas for them. By choosing to paint representationally in a style that demands mastery of traditional skills Nadine Robbins is one of the former. 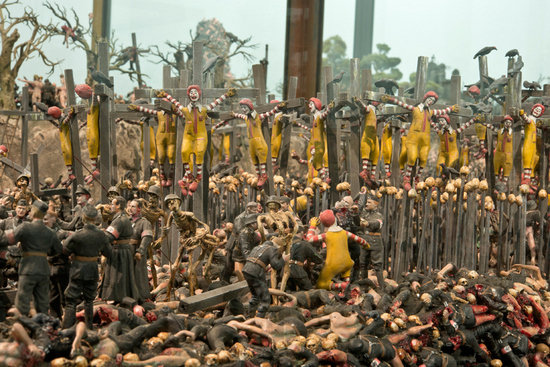 In searching the internet to find other contemporary works of art that involve McDonald's and/or McDonaldization I found myself very entertained by this vignette of a mass crucifixion of Ronald McDonalds from the vast diorama The Sum of All Evil created by Jake and Dinos Chapman. Jake and Dinos Chapman are moralists who have taken advantage of artistic free speech to make a point that is hyperbolic. Their thinking is imaginative breathtaking but also sensationalistic. I don't have as much angst -- or as many fears -- about the potential horrors of extreme McDonaldized culture as they apparently do. The fact that they can make and display their work in a major museum (The Tate) actually contradicts what they appear to be saying. If our culture can value, recognize and support the work of artists who can reflect both our individuality and our collective needs in meaningful works of art we can all enjoy and indulge in a Happy Meal now and then without fear. 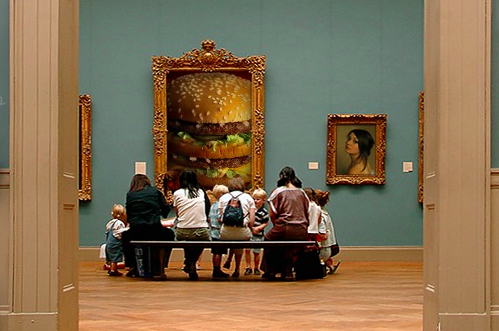 I understand that there is now a McDonald's at the Louvre and the museum is doing just fine.